Asthma is one of the most common chronic diseases of the airways of the lungs. In developed countries it affects 7- 10 % of population, and it has got an increasing tendency. In 2014, around 300 million people globally had asthma, mostly in North America and Europe and with lowest rate in Africa. Asthma was recognized as early as Ancient Egypt .The word asthma, given by Hypocrates in 450 BC, is from the Greek ἅσθμα, ásthma and it means “panting”. The most frequent symptoms are wheezing, coughing, chest tightness, and shortness of breath. These episodes may occur a few times a day or a few times per week. Depending on the person they may become worse at night or with exercise. It is most common with children, more often with boys. Later, there is an increasing number of women, especially at the older age. Asthma is caused by a combination of genetic and environmental factors as air pollution and allergens. Diagnosis is usually based on the pattern of symptoms, response to therapy over time, and spirometry. As there is no cure for asthma, symptoms are prevented by avoiding triggers, such as allergens and irritants, and by the use of inhaled corticosteroids and long-acting beta agonists. Medications are provided in the form of metered-dose inhalers. Lots of scientists, primarily pulmologists, but also others as sport trainers and parents have been asking themselves if asthma patients should take up any sport and which would be the most convenient. It is undisputed that intensive training in certain circumstances can trigger the asthma attack or it can increase the risk together with some other factors. Nowadays, at the beginning of 21st century, there is a prevailing opinion that a certain physical activity helps fighting the illness, reducing and alleviating symptoms. The activities suggested by physicians include swimming in warmer water and exercising in more humid air, walking, yoga, workouts, short track running, light cycling etc. The patients should, of course, take care of the environment and themselves. Doctors often suggest taking up some other sports as martial arts. In fact, it is not widely known that the exercises from martial arts are the most suitable for asthma patients. There are lots of yoga exercises in martial arts that were introduced by Bodhidharma in Shaolin round 520 AD. Martial arts require fast and explosive movements among which there are short, but very useful pauses for asthma patients.The practitioners often perform short running and a kind of workouts. Most of martial arts pay attention to a special breathing technique. Such a technique is performed in kung- fu (chi kung, tai chi chuan, pa qua etc.) in karate (for katas-sanchin,tensho etc.) ,in tae kwon do (forms), but also in aikido, hapkido, judo and many others. The right breathing implies deep breathing caused by diaphragm and chest movement. It is also important to expire completely , which enables the next complete breath. The right breathing technique is practised at the very beginning of martial art practice and many trainers emphasize its importance. All in all, during a sport activity the depth of breathing is increased while respiration is reduced , thus the lungs capacity is enlarged, and circulation and heart function are improved. The appropriate breathing technique reduces muscle tensions which causes the right muscular distribution. Frequent martial arts practice reduces weight. Obese people have the problem that fat tissues reduce breathing functions and can cause respiratory inflammation. The martial arts exercises can be performed both inside and in the open air. By practicing martial arts children strengthen chest muscles thereby improving lung function. 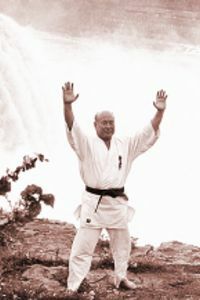 This applies not only to the arts; Kung-fu, karate, tae kwon do and aikido, which in practice require a certain special breathing technique. In other martial arts and skills such as Judo, BJJ, sambo, boxing, kick boxing, wrestling, and mixed martial arts and the like., trainees not only develop upper body, especially the arms and shoulders, but also strengthen the muscles of the chest, which positively affects the breathing function. Often certain exercises are performed in the open, either along the coast or practicing on the mountain. This method of exercise in the fresh air is especially beneficial for those suffering from asthma who have an allergy to dust mites or dust. Exercise in nature is not recommended in certain season for patients with so-called seasonal asthma. Such people should avoid outdoor area at the time of flowering plants, because of pollen in the air. Then they can get asthma attack even if they perform moderate exercise like thai chi or some kata, which would otherwise be definitely recommended. They should avoid to go out and exercise in the cold air. Patients with asthma, unlike other athletes, have to warm up before exercise longer, more carefully and more gradually. Practicing martial arts definitely has an advantage over other sports because warming is longer and more thoroughly carried out. Such warming will largely prevent tightness in the chest. As they carefully and gradually warm up asthma patients should slowly and gradually cool the body in order to prevent asthma attacks directly after exercise. After the training it is good to take a shower with warm water, because it will facilitate the possible symptoms of the disease, and help with muscle relaxation. Also, people suffering from asthma need sports and exercise with short and intensive efforts, followed by a phase of rest. Resting after exercise is necessary in order to slowly change the temperature of the air in the lungs of asthma sufferers. Patients should take some of the fast-acting medication just before exercise. Also, they should definitely take a break, if symptoms of the disease start to appear. During exercise medication should be always at hand, and taken if necessary. It is of most importance that in the first training the patients warn the coach of their disease, and inform him of the methods of providing assistance in the event of an attack. Most coaches have some knowledge about asthma, but they won’t mind if they are reminded of certain methods of first aid in patients with asthma. The advantage of martial arts coaches in relation to some from other sports is the fact that they are usually better informed of a variety of sport injuries. Lots of parents wonder whether the coach will react and know to help their child at the time of an asthma attack. Martial arts coaches, due to their coolness,and because of various injuries they have already seen, will certainly be willing to help your child. A child with asthma attacks can start panicking, but you can be sure that a martial arts coach will not panic, but be mindful, focused and helpful. The coach’s coolness will help the child to calm down, relax and start to breathe easier and more regularly. In the case of an attack, the child may sit, take the medicine and the coach should see if the child takes medication properly. Remember, the person who suffers from asthma must never be allowed to exercise with you if there is no cure. There can be several months without asthmatic attacks, or the attacks appear in a smaller and milder form, and then quite suddenly there is a strong attack. Some coaches can confuse an asthma attack with a panic attack. Sometimes it happens that a child gets an attack just before the fight or a competition, but some coaches attribute it to nervousness or fear that is present in the child. Of course, a certain stress in combination with other factors may be one of the causes of asthma attacks with the child. If this happens, don’t let the first impression fool you, don’t immediately conclude that a child, who is sick, is afraid of fighting. Basically, most of these children later become very successful competitors. One of the reasons for this is that, due to their illness they are very disciplined in training, which is necessary for the martial arts. It is very important that such a child understands the importance of discipline and self-control in the martial arts as well as of healthy lifestyle and the importance of physical exercise. 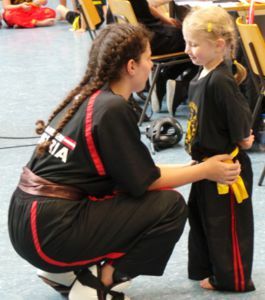 The martial arts coach may often, easier than the child’s parents, instruct the child to a certain strict regimen of life that he(she) must carry out. Such children accept discipline in training, as well as a sport mode of life better and faster than other ones.They hardly ever give up training, even if all of their group do. They’ll come to the training even sick and the coach will sometimes have to slow them down or stop for their own safety. Do not be surprised if such a child after a certain period of training requires that the coach puts him (her) in a fight. The young asthma patients wants to show themselves or to others that they are not only as good as the others but even better. What is interesting is the fact that they mostly succeed. 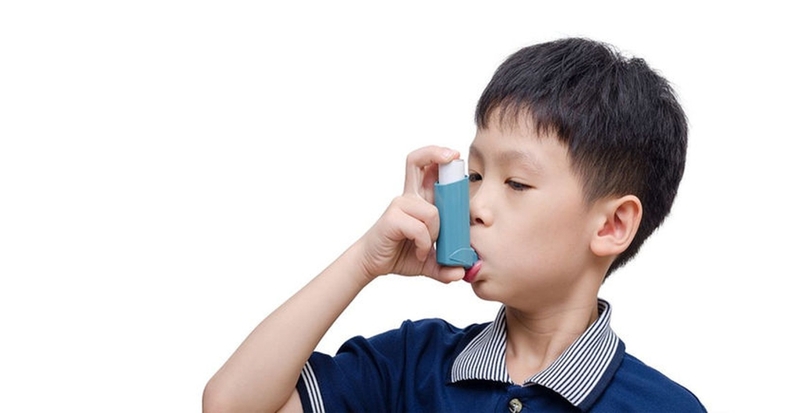 Make sure that children with asthma take enough amount of liquid water as they moisturize the mucous membranes of the respiratory tract and dilute the buildup of mucus. Thus they prevent a possible asthma attack. The coach needs to emphasize the need for healthy eating with such children, and show them the bad habit of consuming fast food (various hamburgers, etc.). It is recommended that these children are sent to some camps, and that clubs(school) know how to organize them .Of course it can’t bring major health changes so soon. In order to achieve it, people suffering from asthma should change the climate, and stay there for at least about three months to get their body adjusted. The best climate is with dry and hot air with no air pollution (such as Egypt or Israel, etc.). The bad thing for such a person is to go first to the mountain shortly after to the sea, because it means changing climate twice, which is not good for them. Also, if they exercise outdoors it is not suggested that such persons should exercise near large rivers, or in the valleys, as well as places with high humidity. On the other hand it is recommended to exercise and stay at sea or the mountain. However, for asthma patients the best place to practice is at a certain altitude where the sea and mountain air mix. Martial arts coaches should know that women in older age often suffer from asthma. Female hormones, like estrogen, can affect the respiratory system as well as allergens and pollen. The increase or decrease of estrogen and its fluctuations can trigger an asthma attack. The stabilization levels of estrogen can have positive effects on asthma. The level of hormones in women drastically changes during the menstrual cycle, but the most dangerous period for an asthma attack is just before the start of menstruation. Any woman who suffers from asthma and wants to exercise and be active should take account of that period. Also, it is desirable to know that women who exercise during menopause more often receive asthma attack. Martial arts have plenty of advantages compared to other sports for asthma sufferers. By training wrestling, judo or BJJ (MMA), people with asthma strengthen their neck and neck muscles, and it also has a positive effect on the breathing function. Moreover, in these martial arts there are a lot of flexibility exercises and stretching exercises, which strengthen the muscles that help in respiratory function. Dealing with these martial arts the practitioner, in particular strengthens the upper body and chest muscles, which helps with breathing. The main characteristic of martial arts clubs is discipline, something that persons suffering from asthma absolutely need. All the time the coach must have control over the training of the person who suffers from asthma. He is the one who sets limits to ill persons and takes care of their condition. At the training, nothing can be performed without the permission of the coach, so that asthma patients will not be allowed to perform exercises that are not appropriate for them if the coach has not approved. For martial arts coaches the following issues are very important: the persons suffering from asthma who practice judo, wrestling, sambo, BJJ, MMA, etc., must be aware of the fact that in the hall there will be a certain amount of dust or mites. With each roll ie. fall, a certain amount of dust rises up. This won’t harm other practitioners but people with asthma will feel it. Don’t be surprised some air freshener has been used in the hall, or something to clean mats. What other exercisers do not even notice may interfere with the exercise. Don’t be surprised if the person who has asthma during exercise gets irritated with some floral perfume, deodorants, shampoos, and even the material of which has been made kimono. All of the above, in combination with other allergens, can cause asthma attacks. There are top athletes who suffer from asthma, too. Thus, among them there are champions of the largest sports competitions, such as World Championships or Olympic Games. Some of them are suffering because of a genetic predisposition, but most of them are suffering because they have been exposed to frequent long-term exposure to certain allergens during prolonged and strenuous exercise. There are those athletes who suffer from asthma immediately after the termination of sports career. Unfortunately, among the athletes who take medication for asthma, there are those who cheat the sport authorities. The medicine for asthma is classified as a doping agent, and it can be used during the competition only by those athletes who have a medical certificate of illness. Unfortunately, wishing to win, some athletes pretend to be patients. But what they do not know is that these medications are not safe for health, especially for healthy people. I hope I’ve at least partly answered the question that is often asked: whether people with asthma can take up sports and which ones are suitable. I also hope that I have helped to complete the understanding of the disease and thus facilitate the exercising for people suffering from asthma. Martial arts coaches, parents, and their children, people with asthma, it is useful to be informed about the disease so that the asthma attack would not surprise you. Be prepared, because the martial arts teach that nothing should surprise us! Croatian David Stainko is a Physical Education teacher, counselor for martial arts skills, and Master of Kinesiology. 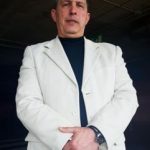 He has studies and ranked in numerous martial arts, is a federal judge for boxing, karate (WUKO). tae kwon do (ITF) and international judge for kick- boxing and savate boxing.